Sea Ray this morning introduced six sportboats — including two jetboats — at a press event at its facility in Vonore, Tenn.
"The opportunity for Sea Ray is to marry a true sportboat experience with jetboat propulsion — something we think has been missing from the market," Brunswick Boat Group vice president of marketing Matt Guilford said during a presentation at Sea Ray&apos;s Tellico conference center on the Tennessee River. Sea Ray executives and technical experts welcomed 10 journalists from media companies such as Lakeland Boating, iboats.com and Boating World to its Tellico facility for the product debut of the 21 and 24 Jet, the 220 and 240 Sundeck outboard models and the 220 and 240 sterndrive models. On Wednesday night, the media gathered at a restaurant in Marysville, Tenn., to open the two-day event. "The recovery in the marine industry has been different in the jetboat category," Guilford told me after his presentation. "Aluminum boats and jetboats have led the recovery. There is a clearly established market there. Sea-Doo&apos;s exit from the market was certainly notable for us. There is opportunity for us as a brand. And there is consumer preference for jetboats." 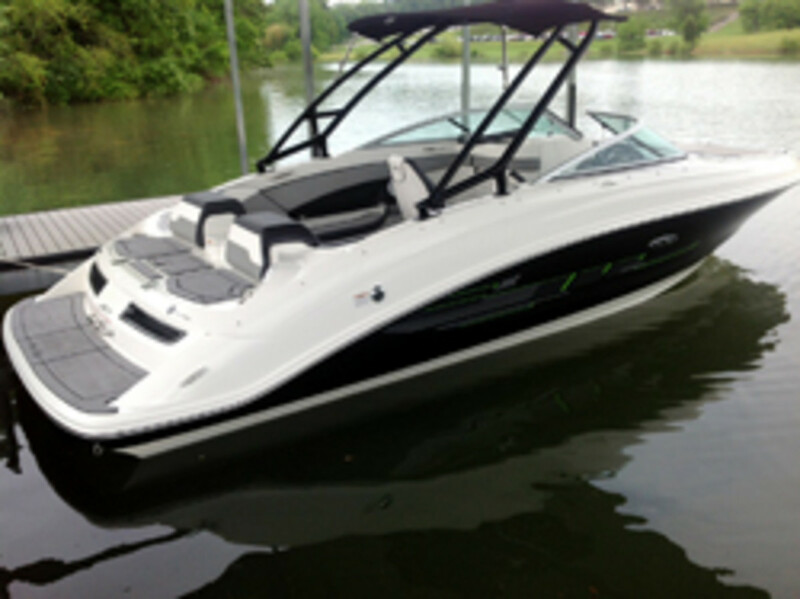 Click play for a look at the new sportboats. The jetboat design allows for shallow-water operation, and the absence of a propeller increases overall safety, he said. The jetboat&apos;s layout also appeals to consumers. "With the smaller envelope of the jet engine configuration you don&apos;t have to have a sun pad or what we call a doghouse in the stern. That gives you more flexibility with the design." The jetboats are also aggressively priced, Guilford said. The outboard-powered deckboats are new additions to the Sea Ray lineup, with new-from-the-keel-up hulls. The 220 and 240 Sundeck sterndrive models use the same hulls as their predecessors, but the builder has updated the boat with new cockpit and deck designs, Guilford said. The outboard-powered boats are attractive to consumers because of their cost, convenience and flexibility, compared with their sterndrive counterparts, Guilford said. "The sterndrive systems have some EPA regulation that has been applied to them that raises the cost of the boat, so particularly with smaller [boats] the outboard boats can now be significantly less expensive than their sterndrive counterparts." The deckboats are on the market and the jetboats will be rolled out in the late summer to early fall, Guilford said. The jetboats are powered with Weber 4-stroke engines and jet drives. The 21, for instance, uses the T-Weber MPE-850TC 4-stroke engine (120 hp), which is turbocharged and intercooled, said Weber Motor director of sales and marketing Dan Schroepfer. "The 24 is powered with a high-output version of this engine with 155 horsepower," Schroepfer said.